Top categories are mystery/thrillers, in hardback and paperback. An estimated 3,625 of those will be available for sale. Children's books, cookbooks, and history are consistently popular categories, and the Book Sale includes 147 boxes of books for children through young adults. Volunteers packed up 59 boxes of cookbooks and 58 boxes of history books. Each box contains roughly 25 books, according to Penny Mills, Library Friends treasurer and book sale coordinator, but the estimate doesn’t hold well for the children’s books because of their size. The Book Sale runs from 4 to 8 p.m. on Thursday, but it is open that day only to members of the Oconee County Library Friends. Anyone can become a Friend at the door for $10 per person and $25 for the family. Sales continue from 10 a.m. to 8 p.m. on Friday and from 10 a.m. to 5 p.m. on Saturday, when everything still left will be sold for half price. All proceeds go to support materials acquisition and programming at the library in Watkinsville. The number of vintage books is up from previous sales, Mills said. This sale will have 25 boxes of vintage books, compared with 13 in the fall of 2016 sale. “Many of these books have lovely artwork and prints suitable for framing,” she said. The sale includes two boxes of vintage 33-1/3 record albums as well as eight boxes of DVDs, six boxes of music CDs, and 1 box of book CDs. The sale includes 67 boxes of general fiction in hardback and 49 in paperback and 46 boxes of religious books. Books are individually priced for the sale, but most books are $2 or less. Children’s books are from $.50 to $2. CDs are $1, and DVDs are $3. Oconee County Library Friends collects books throughout the year in bins at the library and from individuals making donations. These are then sorted by the volunteers, boxed, and, for the fall sale, shipped to the Civic Center. A spring sale is held at the library itself. Phi Gamma Delta, a University of Georgia fraternity, and the Oconee Rotary Club, helped with the heavy lifting of getting the boxed books onto a truck and to the Civic Center, Mills said. Oconee County Library Friends also depends on high school students and other volunteers to help with sales and other jobs. Volunteers can sign up via the website SignUp, accessible through the Friends website. Books not sold at the sale are turned over to Unbound, in Athens-Clarke County. The Fall 2016 Book Sale brought in $20,000, and the February 2017 Book Sale brought in approximately $7,l50, according to Mills. 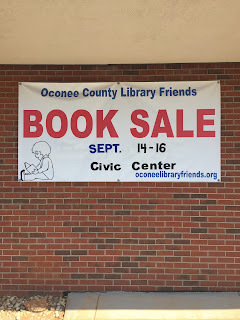 Oconee County Library Friends supports the Watkinsville Library. Bogart Library has its own Friends group.